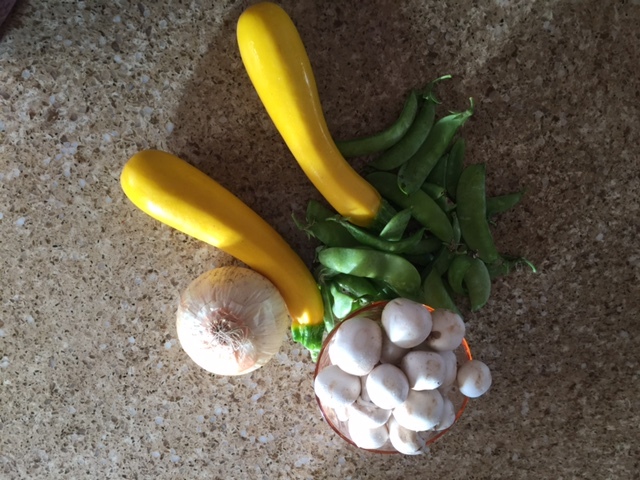 We were able to pick some snow peas, snap peas and zucchini from our garden. It’s getting pretty late in the season, but a few vegetables remain. 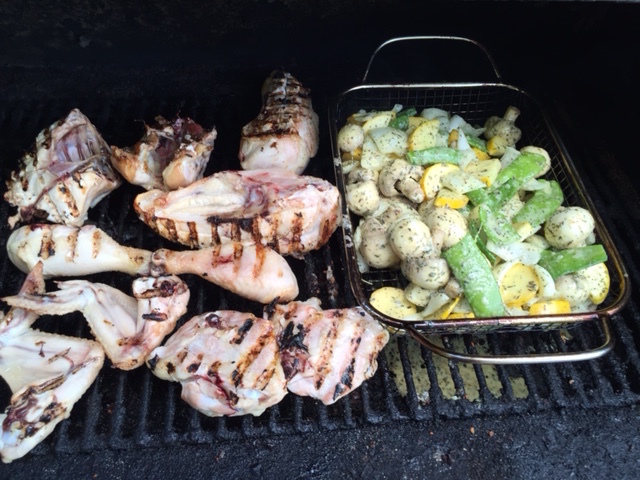 Rob made a marinade and grilled them up for dinner tonight with some mushrooms and an onion. Mix ingredients with a wire whisk. Put vegetables into a gallon-sized zip-topped bag and pour marinade over them. Gently shake bag to coat vegetables. You can grill the veggies immediately or place in refrigerator for a few hours to let the marinade soak in. Spray grill basket with non-stick spray. Place onto a grill that has been heated to 350 degrees. Close grill. Grill for about 25 minutes, stirring twice. Makes about 6 cups of grilled vegetables. Yum! 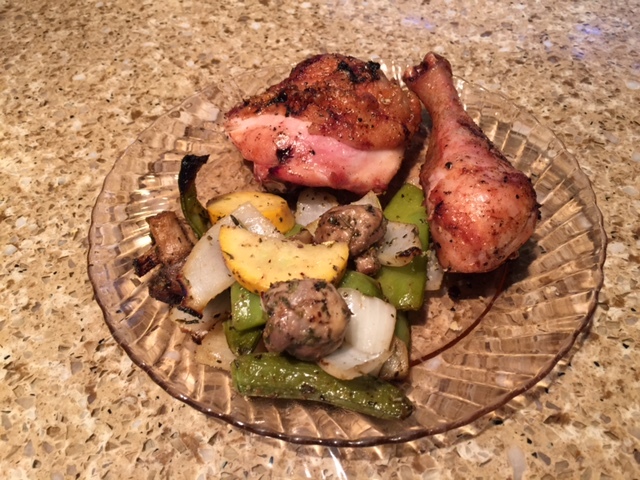 He grilled some of our home-grown chicken at the same time and it all came out extremely well. We served the meal with some cornbread. What did you cook outside today? Welcome to the first post of the blog that gives ideas and tips to make your outdoor experience better. At Uncle Rob’s Outdoor and More, we believe that the outdoor experience should be enjoyed by people of all ages and abilities and we strive to offer products and information that will accomplish that goal. Rob and Becky have e njoyed years of experience enjoying the outdoors with their eight children, 4-H kids, and the community. This blog, as well as their eBay store, is the way they hope to connect people of all ages to the beautiful outdoors! Check their eBay store for gifts, tools, emergency supplies, and more! And check back to this blog for posts on hands-on activities, great spots for family adventures, recipes that taste great over a fire, and more!